What is LOVE, Dr. Cookerly? : An Introduction: What is Love Dr. Cookerly? 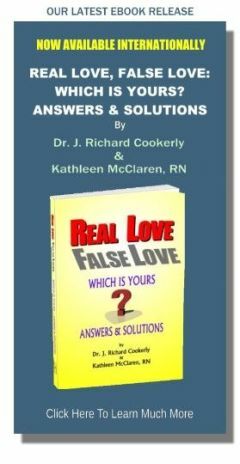 Healthy Real Love: What It Is, What It Is Not, How It Works and How Do We Succeed at It? You are about to read a rare thing. It is an exacting definition of love. Most scholars, writers and authorities who hold forth about love dodge giving any truly definitive definition of love. It usually is held to be too hard, too complicated or just downright impossible to define. Sometimes there is an effort, but it’s a pretty fuzzy one or it is a limited definition confining itself only to spiritual love, sexual love, etc. Here you will find first a practical, every person’s, lay psychology type of clear definition. Each term used in the definition will be briefly explained further so that you can understand this definition much more fully. Next a functional definition of love is added giving you the very important Five Major Functions of Love — defining love further. Somewhat later will follow one type of scientific definition of healthy real love which will introduce you to the Eight Major Groups of Behavior that directly convey love, and then the Four ‘Grand’ But Indirect Ways of healthy real love. The definition you read here and the augmenting material is focused on defining ‘healthy real love’. Later on I will talk about false, wrong headed, misbegotten, stupid, silly, sick and utterly idiotic ideas about love. The how to’s of succeeding at healthy real love, identifying false forms of love, how to use healthy real love to solve love relationship problems, getting more healthy physically, psychologically, relationally and sexually via love, the wisdom of the ancients about love, the fun oddities and peculiarities of love knowledge, and the apparent miracles of love, plus a great deal more will follow. Mixed in with all this will be ways you can use the love concepts presented in your own personal life. To really get a good grasp of this understanding of healthy real love it is lovingly suggested you go over the definition and the discussions of the terms several times, and then talk about it with one or more other ‘hopefully loving’ people.